Audio — Drew Tewksbury. Journalist, Editor, Producer, Photographer. Occasionally I've dusted off my field recording gear and produced radio pieces for NPR and Los Angeles' public Radio outlet KPCC. Early on in my career I worked for NPR's show News & Notes, where I would book guests and write scripts/interview questions for our brilliant hosts. Then for a few years I appeared on the Madeleine Brand Show on KPCC twice a month, and I would write and voice a radio segment called New Music Tuesday, where I would offer reviews of albums that were recently released. Here are a few pieces I field produced, recorded, wrote, and voiced for NPR and various Public Radio outlets. This piece aired on NPR's Weekend Edition on January 28, 2018. 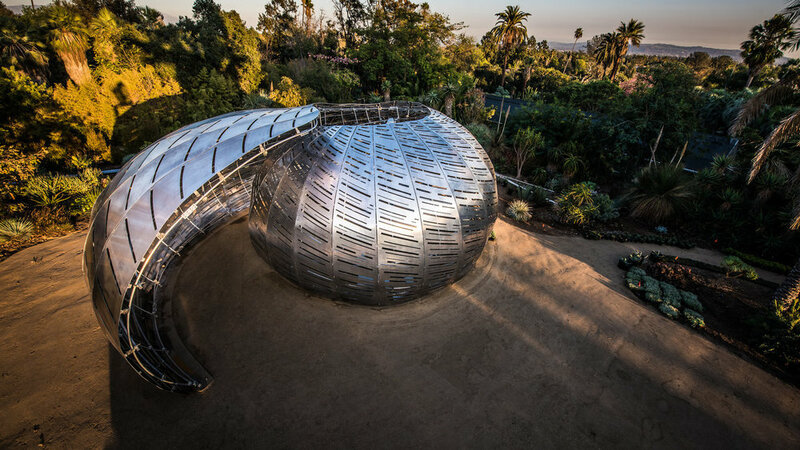 Nestled among palm trees at the Huntington Library, Art Collections and Botanical Gardens near Pasadena, Calif., there's a mysterious, metallic structure that curls like a nautilus shell. It's called the Orbit Pavilion, and it was created by a team of artists at NASA's Jet Propulsion Laboratories, or JPL. Step inside the 17-foot-tall structure and you'll hear otherworldly sounds triggered by the tracking signal of 19 orbiting satellites above Earth. "All day long they move all around you," says artist Dan Goods. "It's much like listening to a bird sort of flying across the sky. And in this particular case, it's satellites that are helping us understand the Earth." Goods heads JPL's visual strategy team, known as the Studio at JPL. His team has made travel posters for planets in distant galaxies, and they've simulated Jupiter's churning atmosphere in a small room. The producer Steven Ellison records and performs under the name Flying Lotus. Photo by Timothy Saccenti. This piece aired on NPR's All Things Considered, May 10, 2010. For those people who generally avoid music made on laptops, the name Flying Lotus may sound like a kung-fu move or a yoga position. But for those in tune with underground hip-hop, Flying Lotus is a household name. His latest album, Cosmogramma, may just take him out of the underground. Lately, Flying Lotus, whose given name is Steven Ellison, has been making a lot of noise. Music bloggers, hip-hop heads and The New Yorker looked to his last two albums, Los Angeles and 1983, as guideposts to the future of hip-hop. Thom Yorke, frontman of Radiohead, handpicked Flying Lotus to open one of his solo tours, and even lent his voice to a track on Cosmogramma. Ellison has earned props by trying to come up with a new sound. Aired on The Madeleine Brand Show, KPCC, January 3, 2012. On the eve of the Super Bowl, there's buzz swirling about which team will dominate, but also about which commercial will make the biggest splash. My favorite commercial - a Volkswagen ad featuring dogs singing the “Star Wars Theme” - went viral even before the big game kicked off. So I tracked down Keith Scofield, the filmmaker who made the hilarious advertisement. 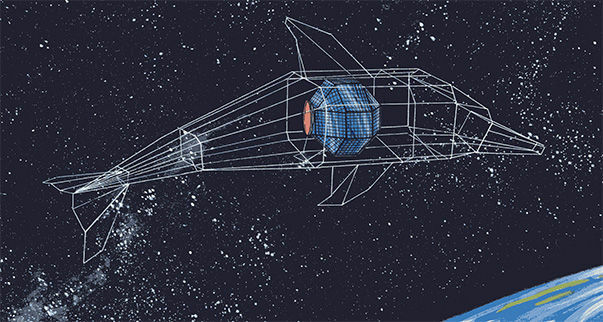 Imagine this: In the not-too-distant future, space might not be the place for just scientists or astronauts. It could be home to everyday people and artists too.